In the midst of primary rain forest lies a pristine ecological reserve, Sacha Lodge is a project that originally begin with only 500 hectares of land has now expanded to its current title of 5000 acres of pristine forest. Sacha Lodge territory is the largest one found in Ecuadorian rainforest, their conservation efforts are truly remarkable, protecting unique natural resources and preventing deforestation in the area. Sacha’s facilities were carefully put together in order to offer the highest comfort possible without getting in the way but rather blend with your surroundings. 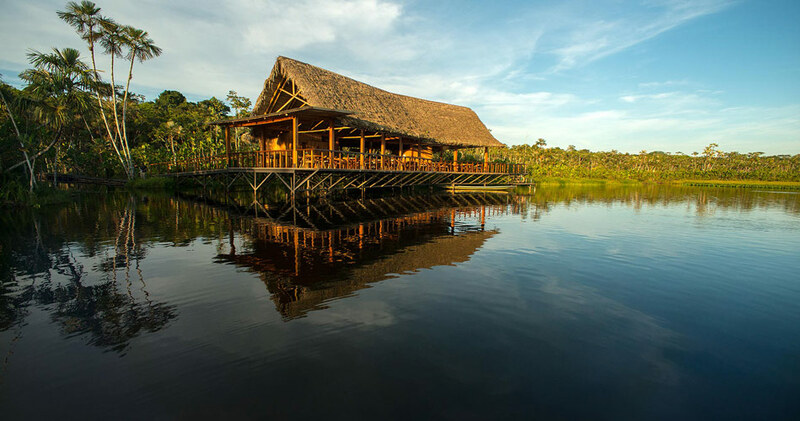 The lodge also features exceptional characteristics, a 245 meter long canopy walkaway with 30 meters above ground with an incredible surrounding view above the canopy ceiling, a parrot lick in Yasuni’s Park, the Kapok tower perfect for bird watching and much more! Superior accommodation with ecological huts that blend with surroundings. Private twin or double cabins with private bathrooms & included toiletries. Various lounge areas throughout the campsite & a spacious dining area with local & international cuisine. Campsites may feature unique trademark facilities like bridges or towers. Included active gear such as rubber boots & rain ponchos. Electricity throughout the camp with outlets available in rooms. 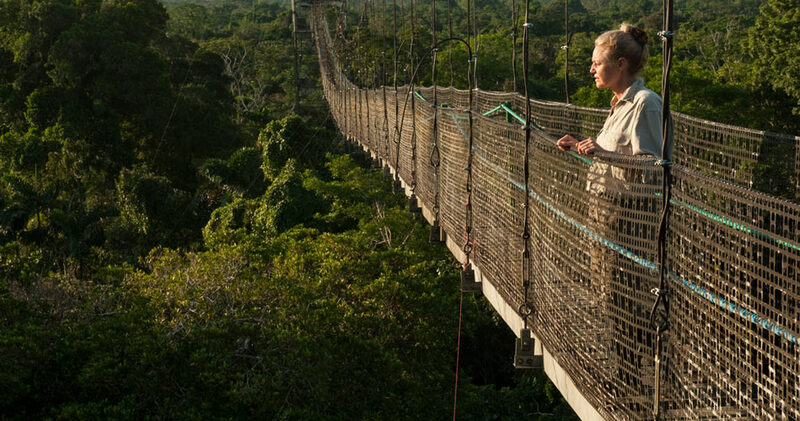 A much anticipated addition to Sacha’s activities is the 940-foot (275-meter) long canopy walkway. At approximately 94 feet (30 meters) above the ground, imagine exploring the rainforest up in the treetops! This sturdy walkway is fixed to the ground by three metal towers for stability, and offers an unbelievable opportunity to spot dozens of animals and epiphytes seldom seen from the ground. 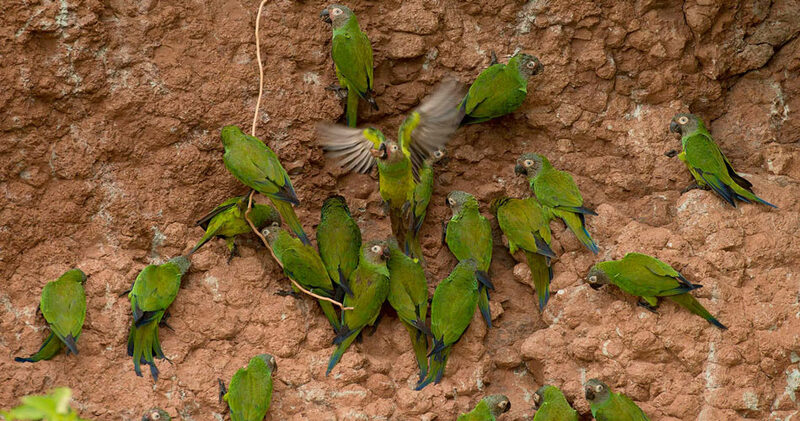 At a short distance from Sacha Lodge is Ecuador’s most accessible parrot lick, an exposed clay riverbank where brightly colored parrots of several different species gather in the early morning. In ideal conditions (sunny and dry) hundreds of parrots will perch on and eat the exposed clay in a spectacular show of sound and color! 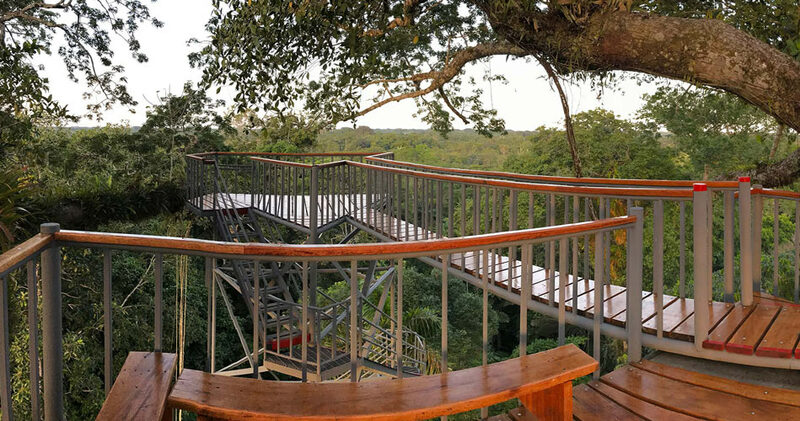 Situated on a hill and constructed around a giant kapok tree for stability, the kapok tower allows guests to climb into and above the rainforest canopy for a magnificent view of the surrounding area. From the tower’s ample platform it is possible to observe toucans, parrots, and dozens of other colorful bird species in the treetops. 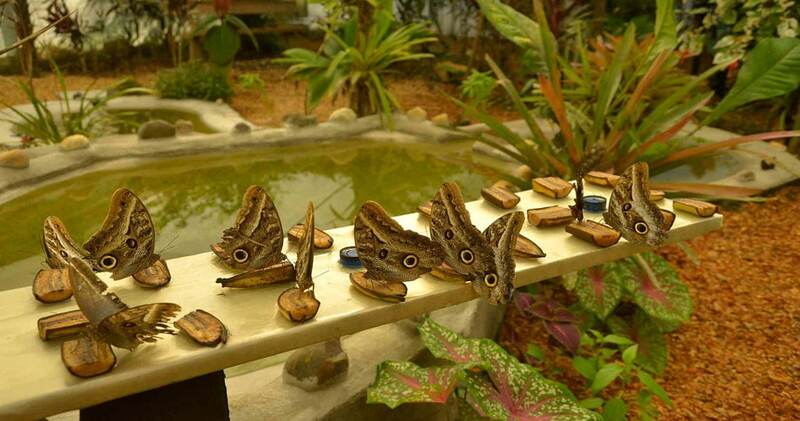 Sacha Lodge is also home to one of the largest butterfly farms in Ecuador, breeding nearly 40 local butterfly species! Sacha Lodge specializes in personalized programs they have refined over many years of experience. Catering to a wide variety of travelers where activities are based on interests and physical ability of guests. Among the most popular activities are. Early birdwatching, paddled tours in dug out canoes, swimming on nearby lakes, night walks and cayman watching. DAY 1 – Depart Quito´s airport at 11:00am (subject to change). A 30 minute flight over the Andes Mountains leads you to a bustling oil town called Coca located in the Amazon Basin. A quick lunch in Sacha´s private house and then its off to the town docks where you will board Sacha´s private canoes for the 2 hour journey down river to Sacha´s Lodges property. 30 minute hike through the rainforest leads you to lake Pilchicocha. Here, you are met by native workers to paddle you across the lake to your final destination. Arrive at Sacha Lodge around 15:30 or 16:00 pm (subject to change). 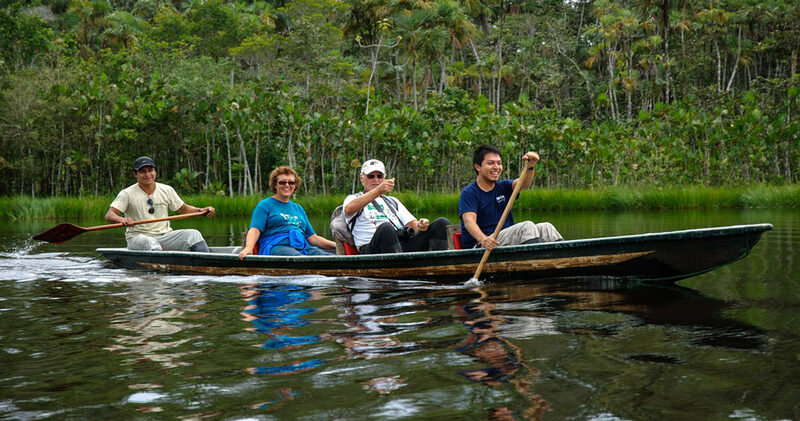 Swim in Lake Pilchicocha, which is a black water lake home to many species of fish and animals. A refreshing swim after arriving may be just what you need after being in the equatorial heat all day. Bird observing from the mini tower offers guests an excellent opportunity to view several species of birds common around the lodge. Also a great place to watch the sun set. Visit the butterfly house with your naturalist guide to view the beautiful colors of many different species of butterflies. DAY 2 – Begin morning activity between 6:00 and 7:00. 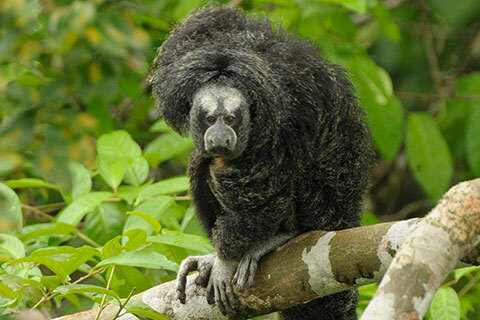 Begin walking on trail Liana Chica and arrive at the canopy walk, for spectacular views of the rainforest canopy and the many different species of vibrantly colored birds. Designed to be a self-standing rigid suspension canopy walk, it is one of only a few in the world! 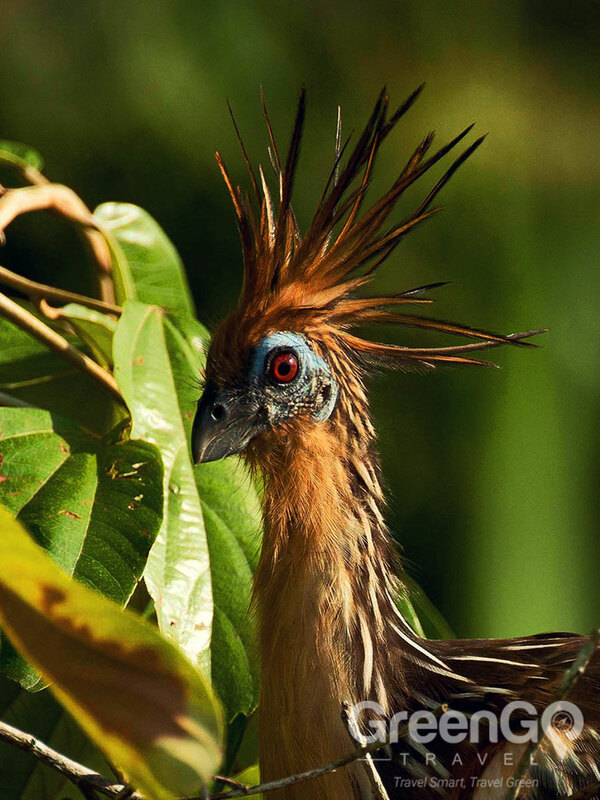 Located within Sacha´s private reserve, 2 miles from the shores of the Rio Napo and 1 mile from the lodge, the bird walk gives guests the opportunity to get an up close and personal view of the rainforest canopy. Two of the three towers have observation decks every 12 meters making towers accessible for everyone. 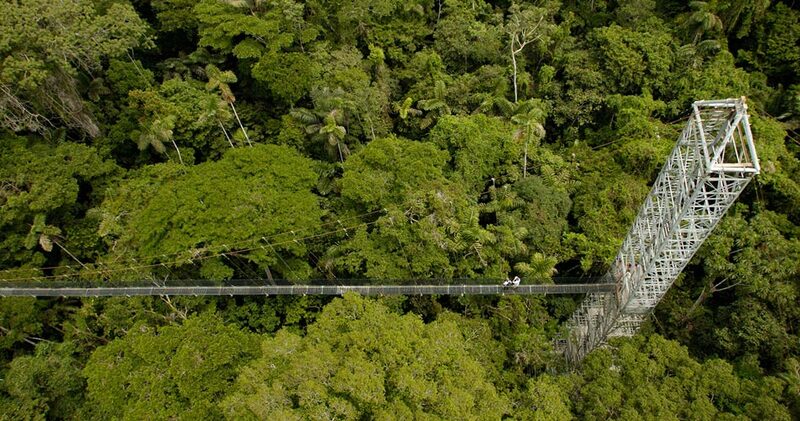 The canopy walkway is at 36 meters high and 275 meters long, giving guests a “birds eye view” of all the wonders and beauty the tropical rainforest has to offer. The canopy walk is designed as a sturdy walkway enabling guests to casually move along while enjoying the spectacular views. After the canopy walk, Liana Grande through terra firma and igapo forest habitats where native guides will explain many different species of medicinal plants that have been being used in their culture for hundreds of years. Liana Grande will turn into the trail Higueron, which will take you through pristine primary forest with huge Kapok and Fig trees towering hundreds of feet above your head. 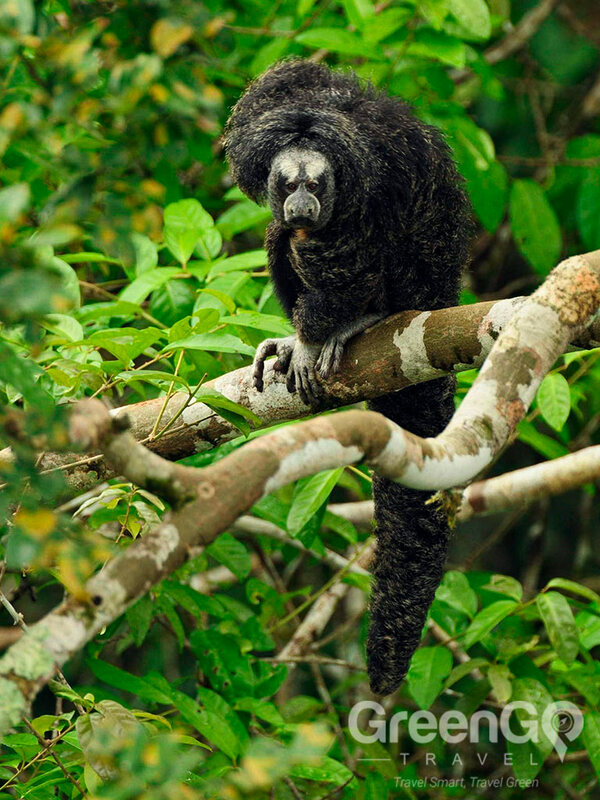 After lunch, you may choose to take a leisurely hike along the Rio Napo, or choose a little more challenging hike on the trail Leoncillo to try and spot the elusive dusky titi monkey. Either way the trails will lead you back to the main boardwalk for your final hike and canoe ride back to the lodge. DAY 3 – Leaving the lodge after breakfast, you begin your hike on trail Lagartococha. This trail offers you the chance to learn more about the native people and their relationship with the forest.Learn about the trees where native people believe the spirits of their ancestors live, and the mysterious “dwende” or devil-man of the forest. 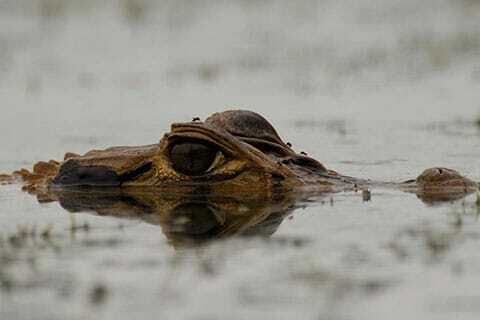 After arriving at lake Lagartococha, take a tranquil canoe ride through a natural swamp, which is the home of anacondas, caimans, and capybaras. After the canoe ride, a walk on the other side of Largatococha may give you the opportunity to spot capuchin or squirrel monkeys playfully jumping through the trees. Return from the walk or canoe ride and head back to the lodge for a refreshing dip in the lake, or a nice relaxing nap in your personal hammock on your private balcony. After lunch, your native guide will teach you how to fish for the infamous razor-toothed piranha. Keep in mind that piranhas will never attack a person and swimming at the same time is perfectly safe and fun! Around 15:30 you will begin what many think is the best trail at Sacha, a silent canoe ride through the flooded Amazonian forest. Where you have a good chance of being surrounded by troops of squirrel, capuchin, and howler monkeys. Keep your eyes peeled for the shy and elusive river otter as well as the incredibly well camouflaged three-toed sloth! After your eye-popping ride through the flooded forest, you will arrive at Sacha´s135-foot wooden tower built around an ancient Kapok tree. Get close up views of vibrantly colored birds through Sacha´s powerful scopes, and watch the sun set with an amazing view of Mount Sumaco, a volcano, and possibly a view of the snow-covered caps of the Andes! Leaving the tower just before or after sunset will give you an experience not soon forgotten. 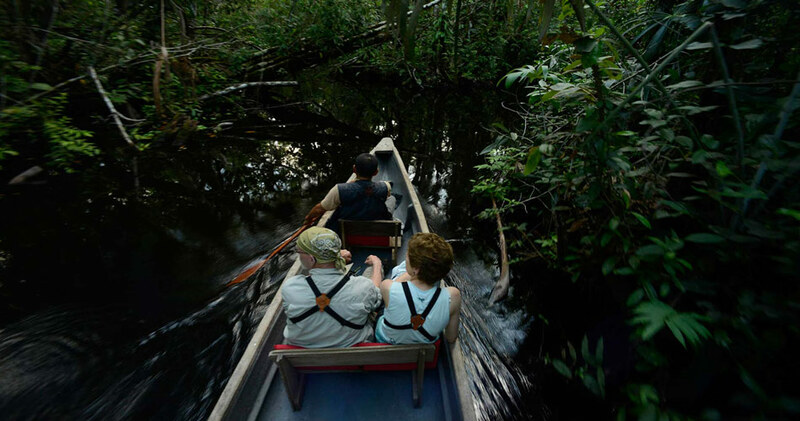 A canoe ride back through the flooded forest at night will be an awe-inspiring experience. Listen to the symphony of frogs and insects as you navigate through the narrow flooded forest trail, keeping your eyes open for caimans. Watch the several species of bats flying over your heads and listen to the many species of nocturnal birds making their eerie nighttime calls. Finally, after your mesmerizing canoe trip through the Amazon, you will arrive back at lake Pilchicocha and the welcoming lights of Sacha lodge. 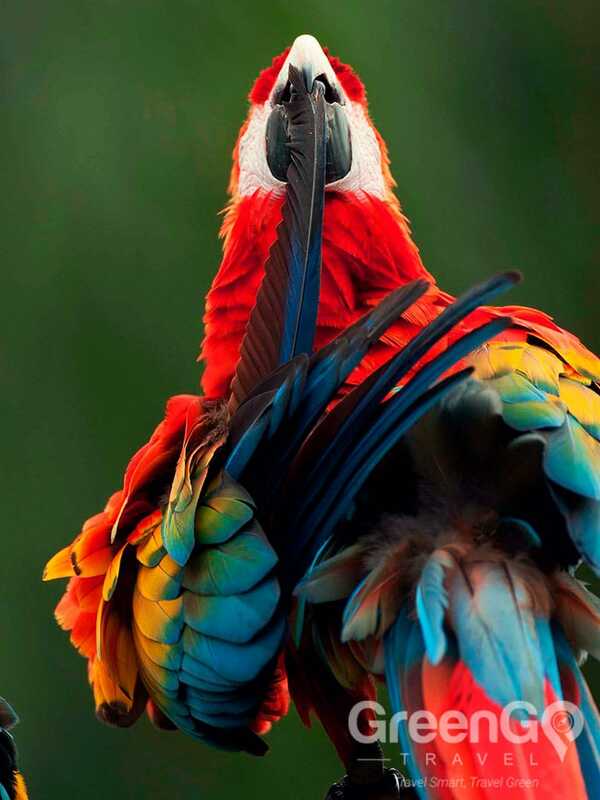 DAY 4 – A chance to view four different species of parrots at the same time is something that should not be missed. Sacha is close enough to Yasuni National Park that a thirty minute motorized canoe ride down the Napo to the parrot lick is well worth it. Leaving at six in the morning from Sacha and arriving at the lick around 7:30 will give you plenty of time to get close up views of the parrots eating the clay to neutralize the acids which they get from eating their many different types of fruits and leaves. Arriving back at the lodge around 11am or so gives you plenty of time to swim or relax before lunch is served. Visit the butterfly house once again to photograph the beautifully colored butterflies. DAY 5 – Breakfast and a departure from the lodge at 7:30am.for an easy walk on the boardwalk to watch monkeys one last time before your final departure. Arrive in Coca and be escorted to the Coca airport where all plane tickets will be in the hands of Sacha employees waiting to help you board the plane and a final farewell. Scheduled arrival at Quito´s airport is at 12:30pm (subject to change). * Operation only available Monday through Saturday, to (enter/exit) the lodge. 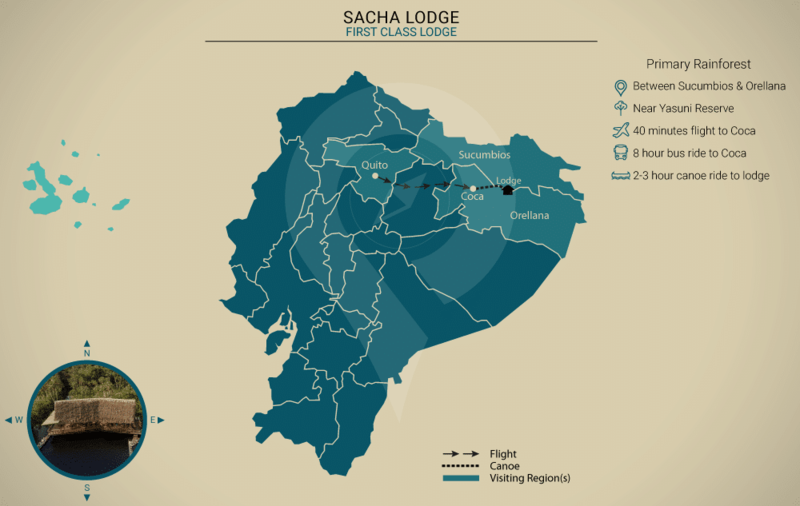 Sacha Lodge does not follow any specific terms and conditions, in the case of requiring a cancellation due to sickness, flight delays or any other reason that might inadvertently affect your tour, your case will be evaluated individually under the given circumstances. Please be aware that your tour reservation will be governed by our terms and conditions, we will work with the lodge on your behalf in order to mediate the best outcome for your case.